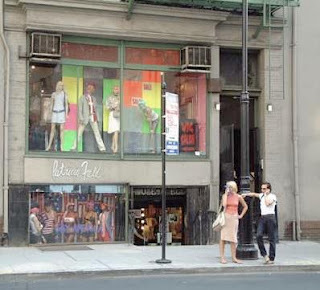 Lady Bunny Blog: I MISS THE OLD PATRICIA FIELD'S ON 8TH STREET! I MISS THE OLD PATRICIA FIELD'S ON 8TH STREET! I miss this the old Patricia Field's on 8th Street! Pat hired me to a few times to "model" in the window. Once for Hallowe'en where I wore a black wig and fangs and snarled at passersby. Unless they were cute men--then I held up a notepad with my # written on it! A Hallowe'en whore who was looking for her boo! ZSA ZSA IS 96 TODAY! XAVIER AT JOE'S PUB ON 2/13!